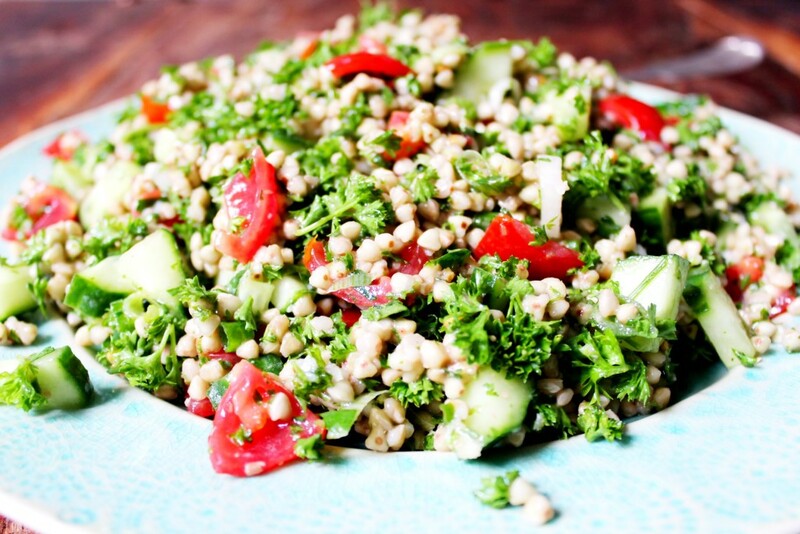 Every time I have tabbouleh I remember how much I like it and I always wonder why I never make it! That all stopped a few days ago when I was craving something refreshing and light to have with my dinner and I finally decided to make my own. 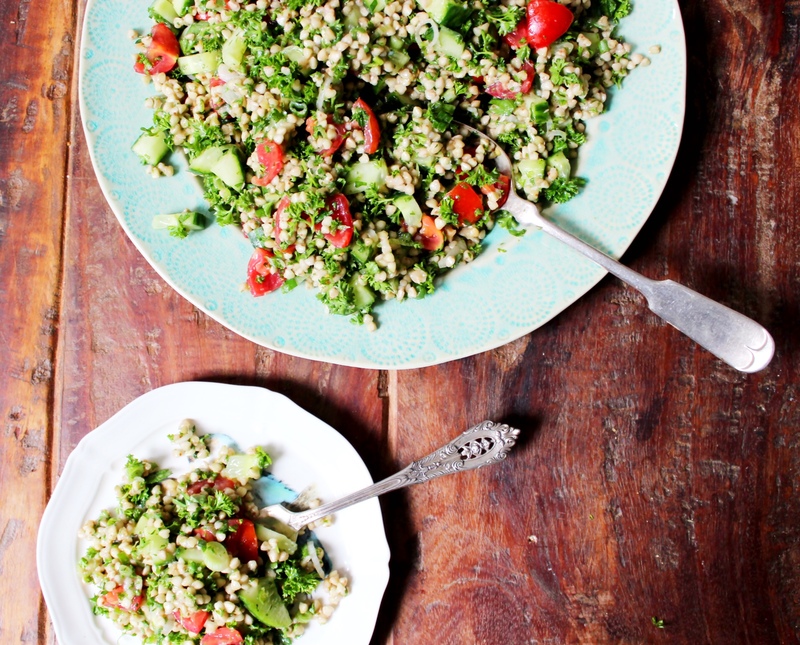 I’ve wanted to try it with buckwheat for ages and the result was absolutely divine. This recipe feeds about 4-6 as a side dish but even if you’re not that many, make it all anyway- it’s amazing as leftovers or as a lunch box filler! I cook buckwheat in a very similar way to quinoa, just with a little less water! Here’s how I do it: Bring 1 and 1/2 cups of stock to a boil on medium heat. Add in the buckwheat and cook for 8-10 minutes on medium heat with the lid off, until almost all of the water is absorbed. Then turn the heat down to low and pop the lid on for a few more minutes until all the water is gone and the buckwheat is soft. Leave the buckwheat to cool while you prepare everything else. Remove the parsley stalks and finely chop the leaves, put a little effort into getting this really fine. When chopped you should have about 2 cups of parsley. Do the same with the coriander and add them to a large bowl. Dice the cucumber and chop the cherry tomatoes into little chunks- I half them and then quarter the halves. Then finely chop the spring onions and add everything to the bowl with the herbs. Combine the olive oil, lemon juice and minced garlic. Fluff the the buckwheat with a fork and then add it to the bowl and toss everything around. Then pour in your dressing and toss once more before serving. 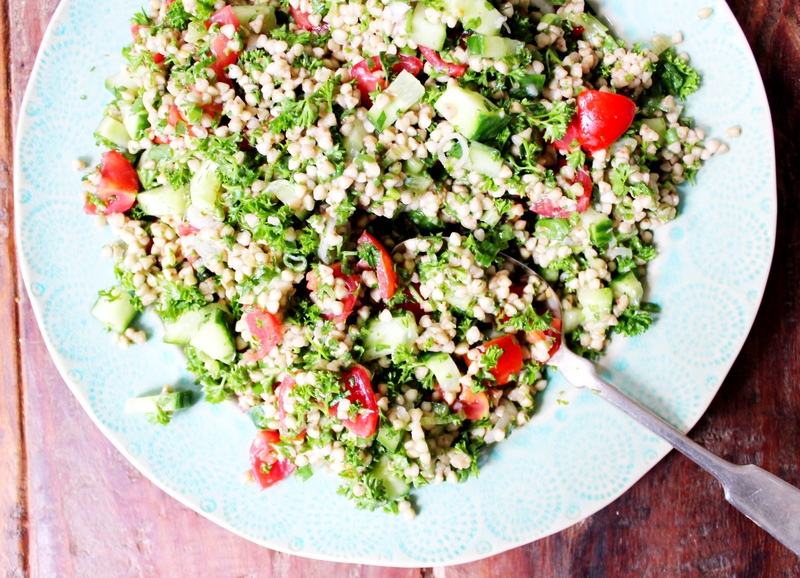 When I studied abroad in France a few summers ago, tabbouleh was one of my favorite dishes to have because it’s so light and refreshing! 🙂 This version looks amazing!! 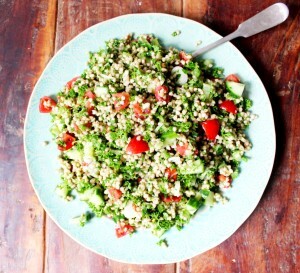 I have had some organic Buckwheat Groats in my cupboard for awhile and was delighted to see your recipe for tabbouleh. I just found that 1 and 1/2 cups of water was way too little to cook the 1 cup of groats, and had to add that amount again and the end result was not as loose looking as your photo. Just wondering if I did something wrong? Love the recipes. Grace. I tried this recipe for the first time last week. It is simple to make and packed full of flavor. It will be a regular in the lunch box for work.